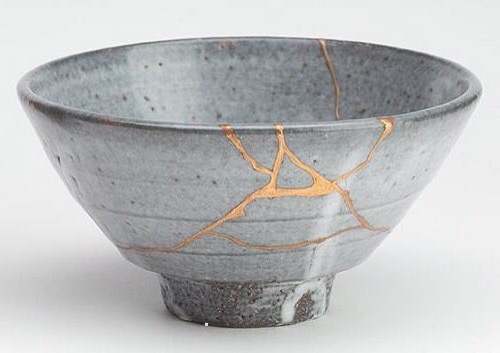 There is an ancient Japanese art of repairing pottery called “kintsugi.” Powdered gold or silver mixed with lacquer is used to glue the broken pieces back together. A cheap, common bowl becomes a masterpiece when mended with gleaming ribbons of precious metals, but as you admire such a piece, you are reminded that the beauty comes at a price: being shattered. Our lives are no different. No person is immune from the pain of a broken world. In some cases, it may be nothing more than disappointment or inconvenience: a rainy vacation, a flat tire at rush hour or a missed birthday party. But those things are light compared to other pains: the negative diagnosis, the broken marriage and the pressure-filled job. When times of major struggle come, we often try to shake free and run the other way. Granted, if the pain is avoidable and unhealthy, we do well to move from it, but sometimes in trying to lessen the hurt, we lessen the purpose of the pain…and the beauty that could come. “It is good for me that I was afflicted, that I might learn your statues” (Ps. 119:71). “We rejoice in our sufferings, knowing that suffering produces endurance, and endurance produces character, and character produces hope, and hope does not put us to shame” (Rom. 5:3-5). “For this light momentary affliction is preparing for us an eternal weight of glory beyond all comparison” (2 Cor. 4:17). The pain we experience is nothing like the pain that Jesus experienced, but at the same time, our pain holds great potential for transformation into His likeness. As I have written before, like nail prints in His hands, our deepest wounds can bear the greatest weight of glory. To be mended, you must be broken. To experience a resurrection, something must die first. The cross comes before the empty tomb. Sometimes you can’t push through the struggle; you must push the struggle through yourself. “By His stripes we are healed,” but by our stripes He is glorified (Is. 53:5; Acts 5:40-41). In your pain, take heart, for into our every wound, Jesus pours grace to pull our pieces together and to bind us to Himself. With each mending, we see more and more of Christ shining from among the broken bits of fragile clay…and less and less of ourselves.